How do international systems deal with the threat and use of weapons of war? In this sophisticated yet accessible analysis, a leading strategic analyst takes readers deep into twentieth century history to answer this question. 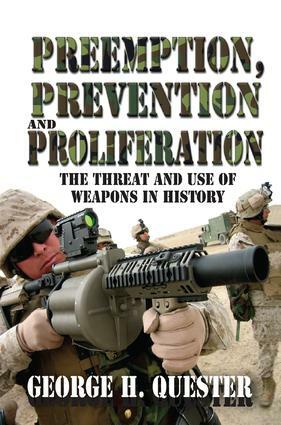 Weapons of mass destruction, and the counter threat of retaliation, have been central concerns in strategic decision- making in World War I, the legacy of World War II, and the Cold War era.Few people can traverse issues of global confl ict with more historical insight than George Quester. His writing is lucid, and his information either new or imperfectly understood in the past. Quester details the ways weapons of war have infl uenced the forging of policies in the twenty-fi rst century. He argues for the retention of appropriate weapons systems, but also for care in when they are used. Priorities exist, but they depend on whether a state is dealing with major powers or rogue states. And off ensive weapons may well become an option in response to non-state terrorist groups or for that matter state-sponsored terrorist acts.When aggression has already occurred, the world is less likely to regard military response as a violation of the peace. Quester cites Clausewitz's adage that the aggressor is always willing to exploit the world's preference for peace. The rise of the human rights movement adds more complexities to preemptive war and prevention, since the line between civilian and military casualties becomes increasingly blurred. The risks may be great, the choices are few--but the needs of military policy making remain high on the agenda. As a result, the concerns discussed here will be on the global political agenda for years to come.